You need some amount of sodium to maintain the fluid-mineral balance in your body. But, too much of it will increase your blood pressure and have a bad effect on your health. Cutting back sodium will definitely help you reduce your risk of high blood pressure and heart disease and will help you maintain good health. 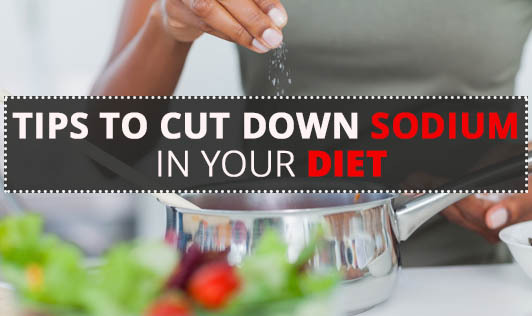 So, here are some tips that will help you cut down on sodium in your diet. • Add additional flavor to your foods. Use herbs and spices like oregano, basil, pepper, thyme, garlic, ginger etc. • Avoid adding salt while cooking rice, pasta, noodles etc. • Use tamarind, lemon or vinegar for taste. • Avoid buying processed, preserved & packaged foods as they are high in sodium. • Always read and compare the sodium content on the nutrition fact labels of packaged food before buying them. • Avoid buying diet products which say "low fat" or "low calorie". These products are usually loaded with high sodium flavor enhancers. • Go for low or no sodium versions of packet soups, frozen meals, canned foods, snacks etc. • Choose fresh food over canned food, as a lot of salt is added to canned foods to increase their shelf life. • Avoid high sodium foods like papad, pickle, processed and cured meat etc. • Limit your intake of bakery products. • Fast foods are not only high in fat, but they are also high in salt. Reduce your intake of fast foods. Pay attention to your sodium intake by making healthy choices!